The star Fomalhaut hosts one of the most spectacular debris disks that we’ve found. There is a narrow, eccentric, outer belt that astronomers have seen with two powerful telescopes: the Hubble Space Telescope and ALMA. Nearer to the star there is a second, warmer, debris disk — like a massive version of our asteroid belt. Furthermore, a planet (Fomalhaut b) has been imaged in the system, although the exact nature of this planet is controversial. Figure 1. 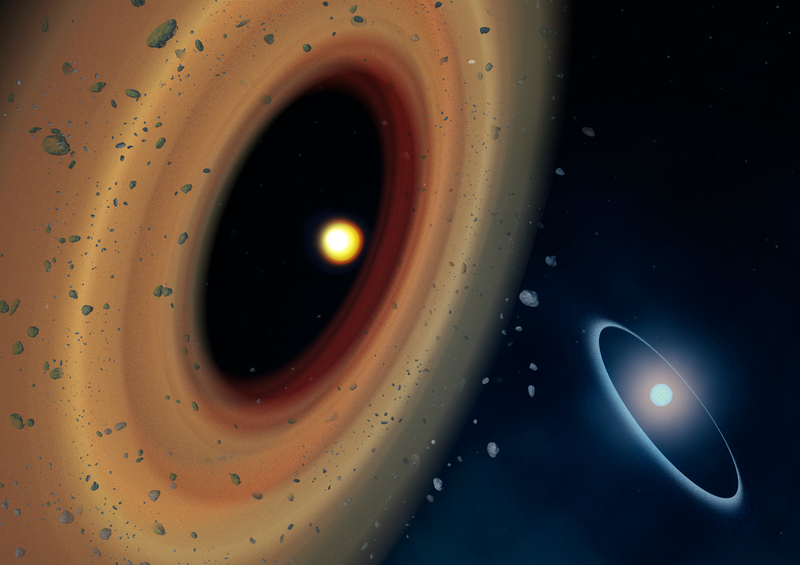 An artist’s conception of the newly discovered debris disk around the red dwarf Fomalhaut C. Fomalhaut A and its famous disk lies in the background. Image credit: Amanda Smith. But that’s not all. Fomalhaut is a trinary system, meaning there are actually three stars gravitationally-bound together. While Fomalhaut is massive, with a mass of 1.9 times that of the Sun, its companion stars are smaller. The second star, Fomalhaut B, is 0.7 solar masses, and the third, Fomalhaut C, is tiny red dwarf of only 0.2 solar masses. The companions are loosely bound to the primary star; B is 58,000 AU (0.28 parsecs) from Fomalhaut and C is 158,000 AU (0.77 parsecs) away. For reference, the Earth is 1 AU from the Sun, and the nearest star to the Sun is 1.3 parsecs away. It was discovered that Fomalhaut C was part of the Fomalhaut system only earlier this year. Kennedy and collaborators used the Herschel Space Telescope to search for signs of debris disks around these two companion stars. Herschel probes far-infrared and sub-mm wavelengths where the light emitted by the dust in cold debris disks is expected to be most strong, but where the stars emit very little light. They found a very cold debris disk around Fomalhaut C, but no sign of a disk around Fomalhaut B. Figure 1 is an artist’s depiction of Fomalhaut C in the foreground and Fomalhaut A and its disk in the background. The Herschel images of Fomalhaut C were not spatially resolved — meaning the brightness of the disk could be measured, but its shape and structure could not be seen. Therefore, Kennedy et al. determined the properties of the disk from how its brightness varies at different wavelengths (its spectral energy distribution, or SED). This is shown in Figure 2. Their detections indicate that the dust emits most strongly at a wavelength around 160 microns, which suggests the disk is quite cold, around 24 degrees Kelvin. Using a somewhat idealized model, a disk of this temperature would orbit at 10 AU for a star with C’s luminosity. However, the authors expect that small dust grains might constitute a significant portion of the disk, which trap more heat from the star. To have a disk with the same temperature as the idealized disk, a disk with small grains would have to be farther away from the star. However, if the debris belt was beyond 40 AU, the disk would have been resolved by Herschel. Figure 2. 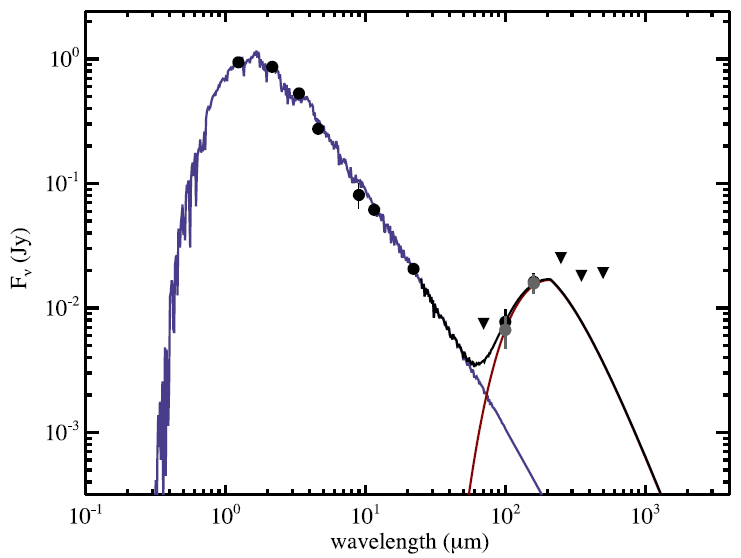 The SED for Fomalhaut C. The short wavelength peak shows the emission from the star itself and the longer wavelength peak is emission from the disk. The circles at 100 and 160 microns show the new Herschel measurements. The downward triangles note the upper limits at the wavelengths where Herschel did not detect any emission. The presence of a debris disk around Fomalhaut C is surprising for two reasons. First, this is only the second known example of a multiple star system hosting multiple debris disks. Second, debris disks are very rare around low mass stars — although this may be simply because such stars have low luminosity, leaving their debris cold and faint. The Fomalhaut system is very nearby (only 7.7 parsecs from the sun), making this detection easier. Fomalhaut C may be the best example for studying the properties of debris disks around low mass stars, which could be common but typically undetectable. The authors also discuss the possibility that the tertiary (C) and primary (A) Fomalhaut stars could occasionally interact gravitationally if Fomalhaut C’s orbit is highly eccentric. These interactions could be the source of the observed eccentricity of A’s debris disk. The interactions would also “stir up” the debris around A, thereby increasing the rate at which individual bodies in the disk collide and produce dust — which could explain why Fomalhaut A’s disk is so bright. If future observations can determine the shape and alignment of the newly discovered Fomalhaut C disk, we may see evidence of such interactions on this disk, as well.